Winter can be a magical time for children, families and friends, and fireplaces provide a special gathering place. 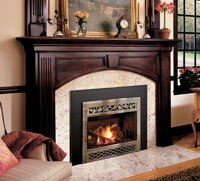 Today, there are approximately 11 million gas fireplaces with glass fronts in homes. As families opt for the convenience of gas fireplaces, some may not be aware of the danger from the glass front becoming extremely hot, and staying hot, long after it is shut off. Touching the heated glass can lead to serious burns, especially to little children who may not understand the potential risk. While these injuries are very rare, even one is too many. I’ve blogged here before on behalf of the Heath, Patio & Barbecue Association(HPBA) about the need to install safety products, like screens and gates, to reduce the risk of burns. Once you’ve selected the safety product that you feel is right for your home and family, take some additional steps to ensure your investment will pay dividends. Match model numbers: Confirm that your safety product is the best fit for your fireplace or stove appliance by contacting the manufacturer of your fireplace or stove. Give the manufacturer your model number, and they may have a safety device specific to your unit. You can find manufacturer contact information at the HPBA website. Secure a proper fit: Proper installation is key to the proper functioning of your safety screen or gate. If you have any doubt about the set up of your safety product, call in the pros. Your local hearth specialty retailer has the training to help ensure the correct installation of safety devices. You can connect with your local retail expert at the HPBA website. Seek out sturdy: The goal of any safety screen or gate is to prevent direct contact with heated fireplace and stove doors. But if children or pets can easily move your safety device, it won’t be able to serve its purpose. This is why you should consider stability and sturdiness of the product you select. Safety products are evolving as new technologies and safety tests are developed. Check with a fireplace retailer or CSIA Certified Chimney Sweep in your area to learn more about safety options for your fireplace. Leslie Wheeler is director of communications at the Hearth, Patio and Barbecue Association, an international nonprofit association that represents and promotes the interests of the hearth, patio, and barbecue products industries.